Immediate preparation of soil for sowing purpose - as the operations like tilling, harrowing, clod breaking, leveling are done simultaneously. Expenditure saving by 60 to 64%. By traditional methods the time required for soil preparation is about 3 to 4 weeks. 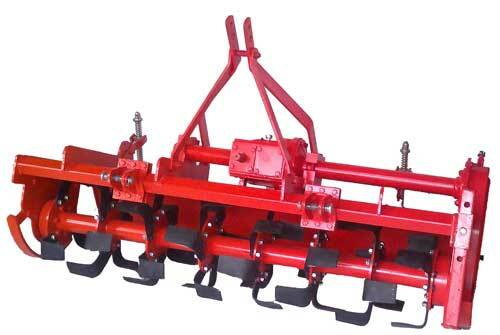 However, by use of rotary tiller the soil is immediately available for plantation/ sowing. Rotor rotation itself helps to push the tractor forward. Lt is therefore ideal for puddling as it prevents the tractor from smling into muddy fields. Fuel expenses saving can be the tune of 18 to 39%. All these savings help to recover the capital investment in machine in two seasons. As rotary tiller can immediately prepare the soil, the soil moisture of previous crop does not go waste. Weight 415 Kg. 450 Kg. 485 Kg.